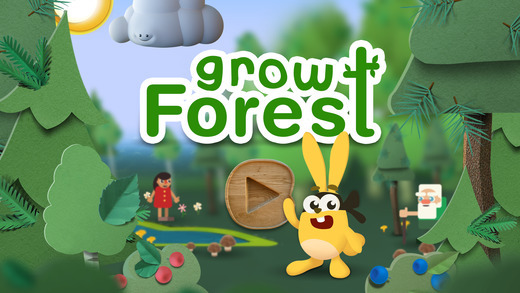 [prMac.com] Stockholm, Sweden - Good-game-experience studio, Gro Play today introduces Grow Forest, their new kids play app for iPhone, iPad and iPod touch devices. Developed for ages 3-9 years, Grow Forest is a city builder game and a mini game collection, in which children develop a wonderful, healthy forest community and learn about environmental topics in a simple and entertaining way. In this particular forest, Banja the rabbit and her friends are waiting for you to help them build a wonderful, healthy forest community. Plant and chop down trees to create wood that you can use to build houses, roads and renovate buildings. You can also create comic books, building blocks and other fun stuff. The forest provides a wealth of things to do and produce. If the forest is feeling good, the inhabitants of the forest feel good - and not just the animals and humans. The supernatural beings of the forest, such as imps and trolls, will also be delighted and will thank you with their love. So step into the magical forest and start playing! The main purpose of the game is to entertain, but also to pique the player's curiosity of the forest and the part it plays in creating a sustainable society for us all. There are no stressful moments in the game, and children can play at their own pace, never risking getting stuck at any point. Grow Forest is a fun place for kids to learn about sustainable forestry and environmental topics in a simple and entertaining way. Grow Forest 1.1.1 is Free (with in-app purchase) and available worldwide through the App Store in the Education category. To buy the full version the users can make a one time purchase ($3.99) inside the app. Players will be able to continue building the world they have created in the free version. There is also an Android version available on Google Play. For more information, please contact Kristian Lundquist. Gro Play is an creative studio that makes toys, games and content for children and families. At Gro Play we create Good Game experiences in order to entertain and inspire children and their families to learn more about health, wellbeing and sustainable living. We believe that Play is not only the most fun but also the most powerful way of learning. By entertaining and inspiring children and their parents, together we are shaping a healthier and more sustainable future. Gro Play was founded in 2010 by the social entrepreneur Patricia Rawecka (now Richter). Copyright (C) 2010-2017 Gro Play Digital AB. All Rights Reserved. Apple, the Apple logo, iPhone, iPad, iPad mini, iPod touch, and Mac are registered trademarks of Apple Inc. in the U.S. and/or other countries. Other trademarks and registered trademarks may be the property of their respective owners.